So many fresh new concepts surfaced in the world of interior design in 2018! Designers of fashion, architecture, furniture, and interiors alike have been pushing the envelope, making 2018 one of the most productive and innovative years yet. Along with new technologies and concepts, designers also reintroduced past trends. Here are some trends that made an impact in the interior design world this past year! Open-concept floor plans are still going strong. The structure of wide open spaces with minimal walls is ideal for people who love to entertain. They’re also a great option for families and children. A new trend this year was playing up open-concept kitchens with u-shaped islands. This style is a modern take on a classically driven design derived from the 1920s “breakfast nook” idea. 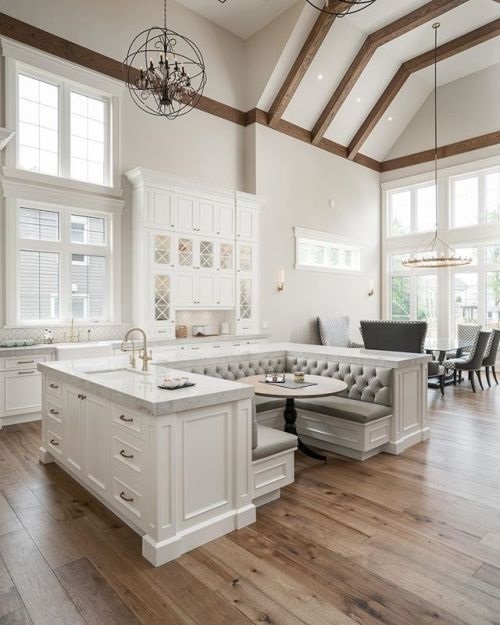 Notice how this keeps the focus on the kitchen as the “heart of the home” and allows for comfortable seating options, encouraging family meals and quality time. Stumped on how to begin designing your space? Many designers this year turned to a wallpaper pattern and then built around it. 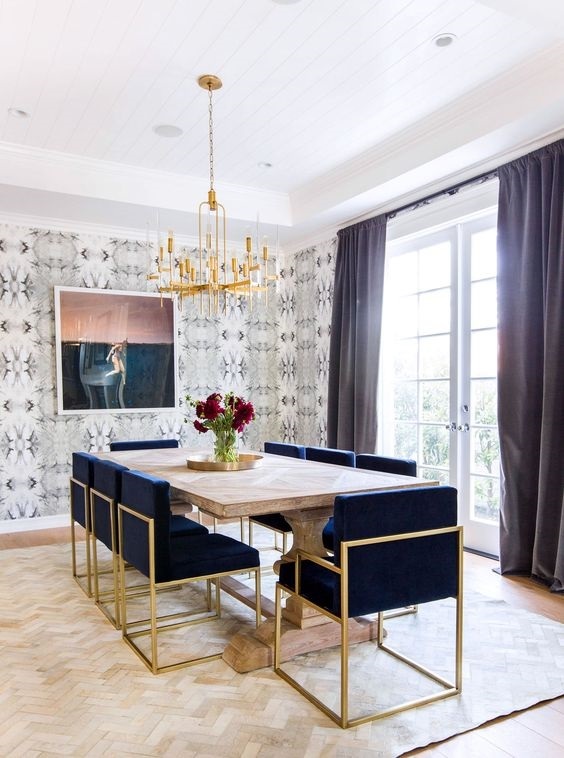 Consider papering a dining room or powder room to create some drama. Murals are another great option. There is a plethora of choices when it comes to wallpaper. Thanks to great strides in technology, digitally printed wallpaper gives us limitless, unique patterns and illustrations. 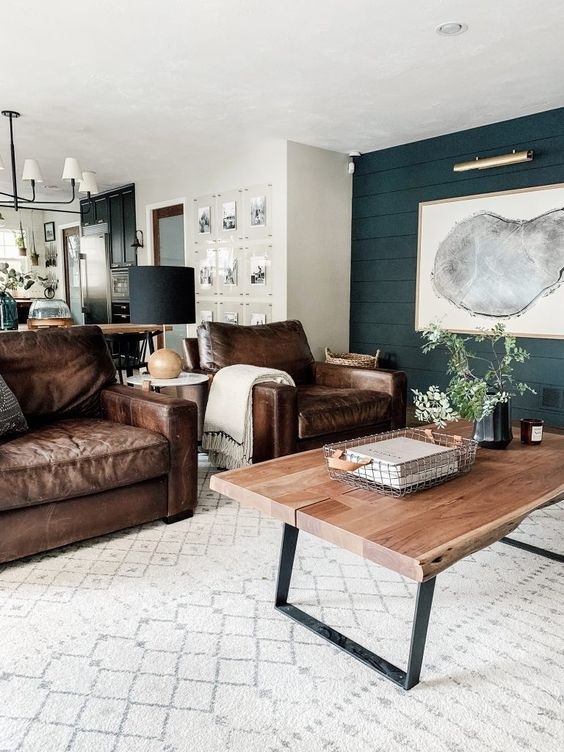 Whether you decide to create a focal wall, paper an entire room or add a splash in the back of a bookcase, this trend proved to be an awesome alternative to paint. The popular cooler, grey and white colour combinations continued to thrive in 2018. Warmer tones have made an impact in the design world this past year, too. Resorting back to the comfortable hues found in nature, homes began to incorporate browns, beige, and rich green hues. Wood grain has continued to be a theme both in furniture design, accents, and wall coverings. Finding a balance between contrasting light and dark elements has resulted in a unique and organic simplicity in design. Tile is a perfect way to add character and novelty to bathrooms and kitchens. 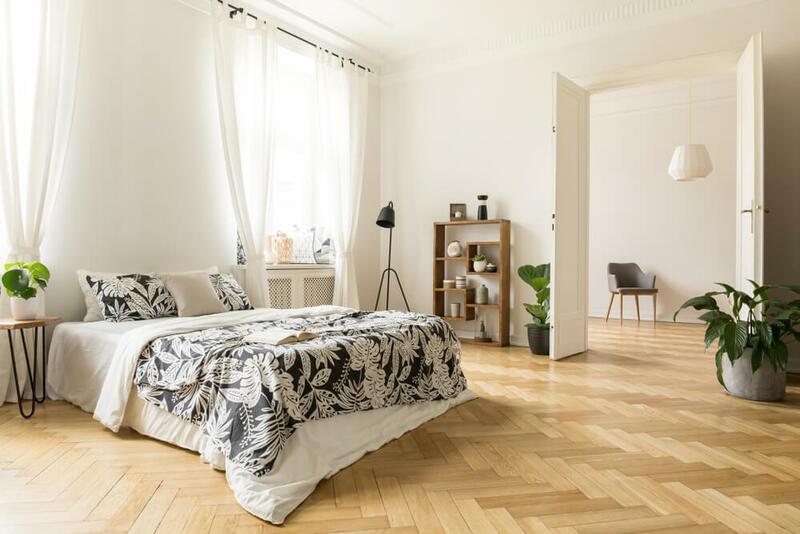 Flooring can be one of the most influential and impactful places to add a distinctive tile pattern. 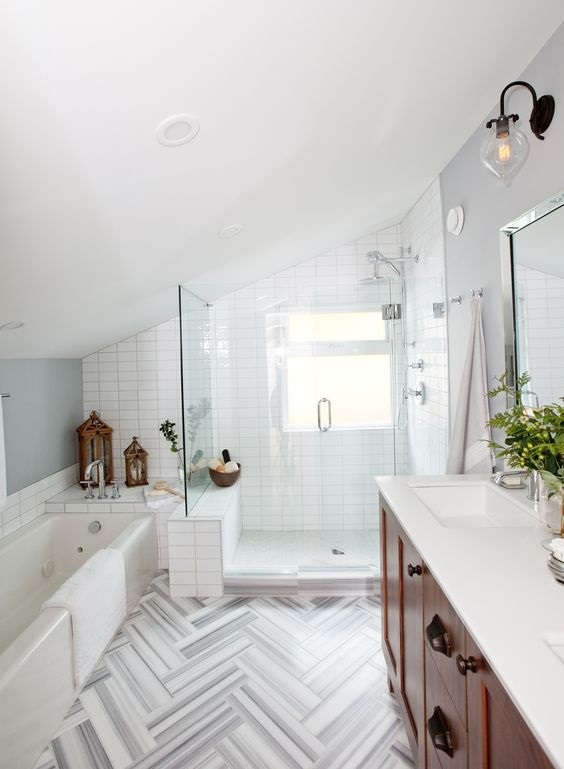 Something as simple as changing the orientation of the tile, such as installing tiles in a herringbone pattern, can be a major game changer. 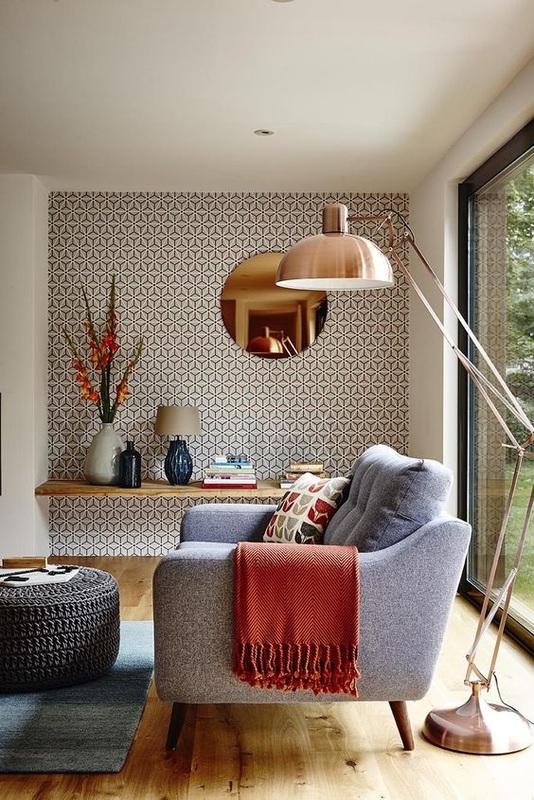 This year homeowners and designers playfully selected interesting shapes, patterns and colours for tile. My personal favourite trend of 2018 was making appliances disappear. Many kitchens have been getting a makeover that revolves around hiding appliances and clutter. 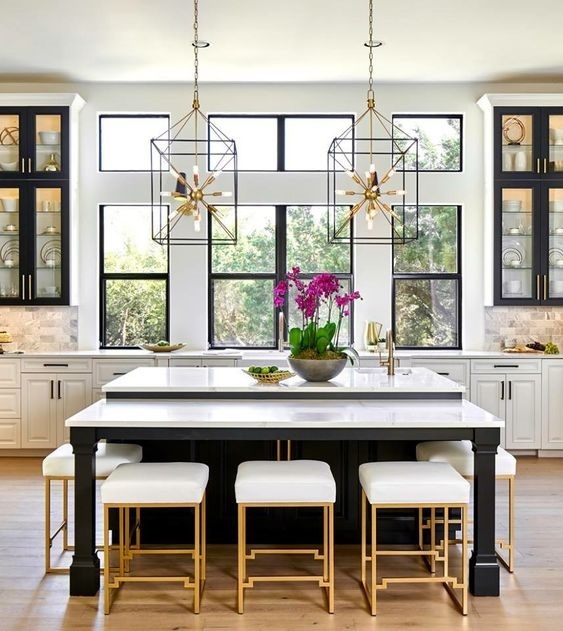 Cabinetry that extends from one wall to another, seamlessly gliding over the surface of refrigerators and dishwashers has become a prominent feature in kitchen design. Regardless of the style of a kitchen, panels can be applied to the exterior of appliances to disguise them to feel like cabinet pieces. 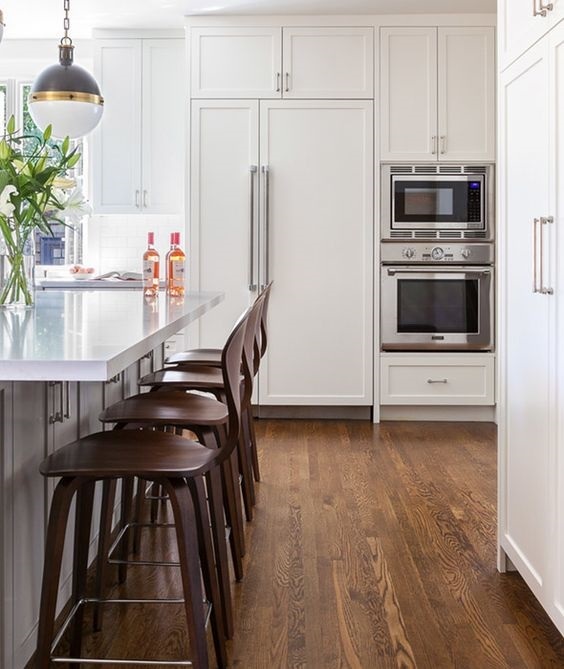 This works especially well in open-concept floor plans where you want your kitchen appliances to fade into the background, so the focus is on cabinets and hardware. Lighting is always a major player in any design. 2018 has been a year of lighting. Nearly every new home, remodeled hotel, and upcoming retail store has focused on incorporating the perfect light fixtures. Lighting is used to highlight a certain area, piece of art, or add a romantic glow. The fixture itself can also be a statement piece. This year I saw a draw toward large-scale fixtures, either as stand-alone focal points, or grouped together. Many furniture and lighting manufacturers are finding inspiration from mid-century design and incorporating it into their products. The organic shapes and sleek lines mesh to create an understated, effortless elegance that adds beauty to any space. The incorporation of curved lines and rich materials has made its way into rooms this year. The best part about this trend is that while it is tied to a specific era, the look is ultimately timeless. 2018 was a year of simplicity and taking cues from nature. We saw everything from flooring, to wall coverings, to furniture with warmer finishes and more organic spaces. Did you incorporate any of these seven trends into your home? What is your pick for best trend of 2018? Check out our Pinterest board to see other examples of these 2018 interior design trends.